There is no doubt about it. Work-at-home customer service jobs are plentiful. But what if being on the phone all day helping customers just doesn’t sound like your cup of tea? If there is a particular subject that comes naturally to you, being an online tutor might be the answer for you. Tools like FaceTime and Skype make it easier than ever to do from home. As a parent of kids who had struggles in high school math, I can attest to the fact that a good tutor with a flexible schedule can be worth his or her weight in gold. Word of mouth is an excellent way to get your name out there, or there are sites like Thumbtack and Wyzant that can help you to market your services to interested parties. Or check out platforms like Gogokid and Cambly and become an ESL tutor. If specializing in one particular subject or topic doesn’t sound appealing, helping kids prepare for their SATs or ACTs can also be a lucrative option. Want to know more? 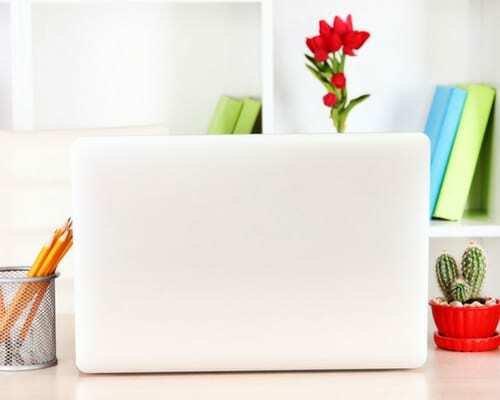 Check out this big list of companies that hire remote tutors and teachers. If you are multilingual, you can capitalize on your skills as a work-from-home translator. Ad agencies, publishers, website content developers, and many others can benefit from the services of a Translator to convert text from one language to another. While it is true that there are free tools like Google Translate, it does not always interpret the finer points of each language like a fluent speaker would. Looking for companies that hire virtual translators? Check out this list of companies that are hiring for translation work. If you are a relatively fast typist with a good ear, you might want to think about providing transcription services. The thought of it conjures up the image of the 1950s secretary listening into her boss’ voice dictation, but believe it or not; these services still have a lot of practical uses in modern times. For example, web developers can benefit from transcribed, text only versions of audio or video files on their sites. This helps people with multiple devices or needs access the content on the site (e.g. transcribed web assets are more user-friendly for people who may be hearing impaired). Or, individuals who are conducting research by conducting interviews via voice or video recordings can benefit from transcription services, too. Want to find out more about this opportunity? Check out this article for more details and companies that hire remote transcriptionist. There are varying levels of expertise and training required to be a web designer. Many people who do this successfully have been trained in art, graphic design, HTML, etc. But, there are others who maybe don’t have the same level of graphic or web design education, but have perfected their knowledge and skills in content management systems, like WordPress. Some people are just looking for someone to help arrange their content, keep their site fresh and engaging, and continually leverage the tools available via platforms like WordPress, and are less concerned with branding or creative design and are perfectly content with one of the millions of pre-fabricated theme’s available for purchase. For more information on graphic design work — check out this article. When developers are building new websites, Q&A testing is an integral part of the process. But the act of reading through the site, testing forms, checking links, etc. can be very time-consuming. That is why some developers outsource that task to others, and since it is web-based work, it can translate to the perfect work-from-home gig. If this sounds interesting or fun to you, check out UserTesting and UTest for possible opportunities. Looking for more website testing gigs? This list has more companies that hire for this sort of work. Many organizations want an active, lively presence in their social communities across the various social networks. But, creating content, posting, moderating comments, and keeping the overall vibe of the community authentic, constructive and positive can be a full-time job. A quick search on Indeed or Google will show you just how popular these jobs are. Since the role is obviously web-based, many of them are remote positions. Check out this article for additional details on social media management jobs. Freelance writers, content developers, editors, and proofreaders may be some of the most popular non-customer service jobs available for remote workers. There are dozens of sites that hire for this, like Freelancer, Upwork, BloggingPro, Problogger, ProofreadingPal, Gramlee, and much more. If none of these ideas appeal to you, you might want to think about the dozens of freelance opportunities available. Sites like Upwork, Freelancer, and Fiverr allow you to submit a proposal to your potential employer for any job that interests you. 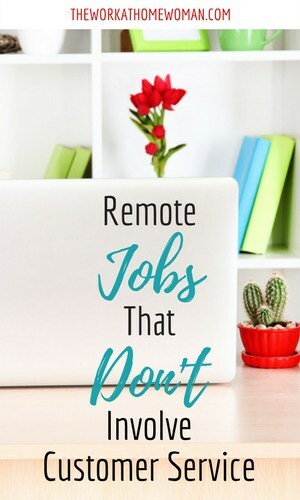 You can also search for a host of traditional and non-traditional work-at-home roles via remote-focused job boards like We Work Remotely or FlexJobs. If being chained to the phone answering customer service calls sounds like a nightmare to you, the bottom line is there are opportunities for remote workers in almost every talent area, specialty, or interest out there. What non-customer service work-at-home job do you have? What resources or tools did you use to land your gig? Christy Schutz is a communications professional, and freelance writer focused on topics like employer/personal branding, career management, personal development, women in the workplace, and female entrepreneurs. She enjoys putting 16+ years of experience in the advertising, recruitment marketing, employee/internal communications and special events industries to good use by helping others to discover, develop and market their own distinct calling or mission. This Tampa Bay, FL-based Mom also keeps herself busy by raising 4 kids, caring for her husband & doting on her dogs Petey and Daisy! I’m looking for a non phone, not dealing with people type of job. Are there legit jobs that do worksheets you fill out from your computer or print out, and you fill them out by hand? I would love to do a job like that. Please let me know where to find them. If you have further questions — let me know, happy to help! Social Media IS customer service and it’s a total nightmare because you’re dealing with angry “customers” (whether actual purchasers or readers or website users, etc.) in a very public space where everyone can read what happened and how you are handling it. Social media managememt is like doing customer service on a stage with a huge audience! I would absolutely NOT recommend it if you hate customer service. Hi Sasha, You’re right. Even though social media falls under the marketing umbrella, there is some customer service involved. And depending on which company you’re working for there may be a LOT of customer service involved (I’m thinking of all the businesses that use Twitter handles for customer service queries). However, there are some platforms like Pinterest that that require little to no customer service or interaction. So my suggestion for social media is if you want to avoid providing customer service look for small businesses and bloggers to work with or manage platforms that are more image-based like Pinterest, Instagram, and YouTube where you are less likely to run into customer complaints. Thanks for stopping by! I agree I don’t like dealing with people who are mean or rude . This is very helpful for I would like to try something else besides being on the phone all of the time. I just didnt have any ideas. Thank you very much.